We’re never quite sure how to handle NEOCON. Should we do a booth? Do we try to host a customer event offsite? We don’t have a product to sell directly and we really can’t help the majority of the people attending with what we offer. Plus, most of our customers are focused on sales and the team we want to talk to, buyers and opps, may not even be there. AND, everyone is so busy with the show! So, this year we decide we would fly in, walk the floor, and see what people were making, showing and talking about. Here’s what things looked like from our point of view. 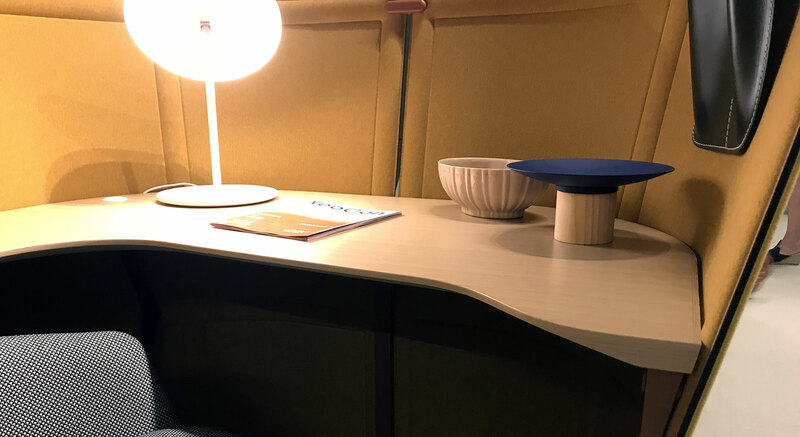 Wow, we saw a lot of melamine at the show. We wonder how much of this is actually getting sold vs. shown. We know melamine is a cost effective solution if you’re buying in large quantities. It’s not as durable as HPL, but it can do the job in many situations. We continue to watch the market and see how much of this is actually being manufactured. Every year we consider producing this in our facility but right now it still isn’t what our customers need from us but maybe that will change soon. 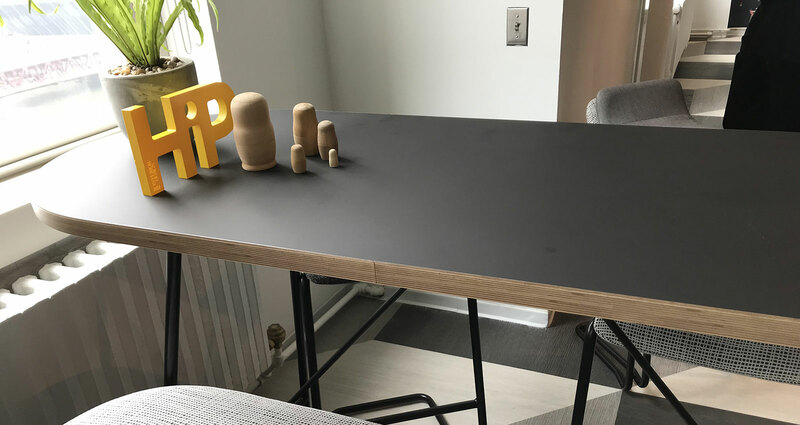 One big trend we saw at the show were HPL surfaces with raw sanded plywood and MDF edges. These have a really cool look given the juxtaposition of the smooth and sometimes colorful laminate top to the more rustic wood on the side. Many of these were straight cut but others were routed to different shapes. We also saw a few with a clear coat over the substrate. 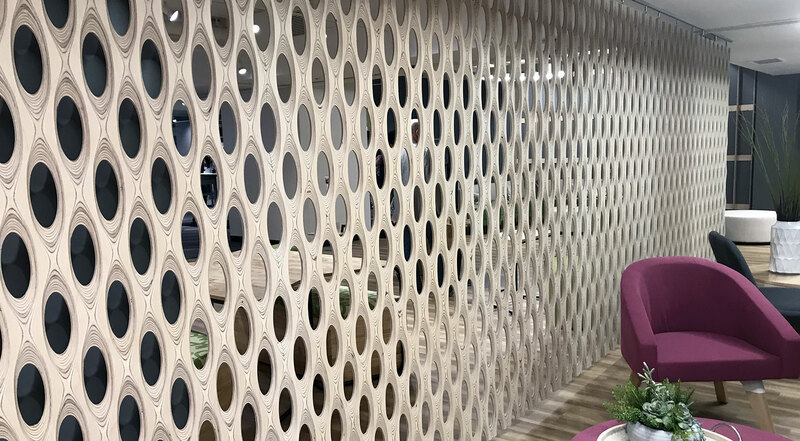 Another variation on this theme, and one that we can manufacture, was the use of PVC edgebanding that looks like plywood. This option allows the use of particle board for the substrate and makes the table edge much more durable. We’ve seen more of this come through our shop recently and anticipate more in the near future. In addition to the unfinished edges, we saw a lot of other unique edges. Probably the most popular were worksurfaces with edgebanding that had been cut to a knife edge and then finished. Many had the wood painted or clear coated to match or compliment the edgebanding. We also saw a decent amount of post forming, but this was a much smaller percentage. A finished knife edge could be something we’ll consider offering in the future. It’s always nice to see a customer find success at the show. 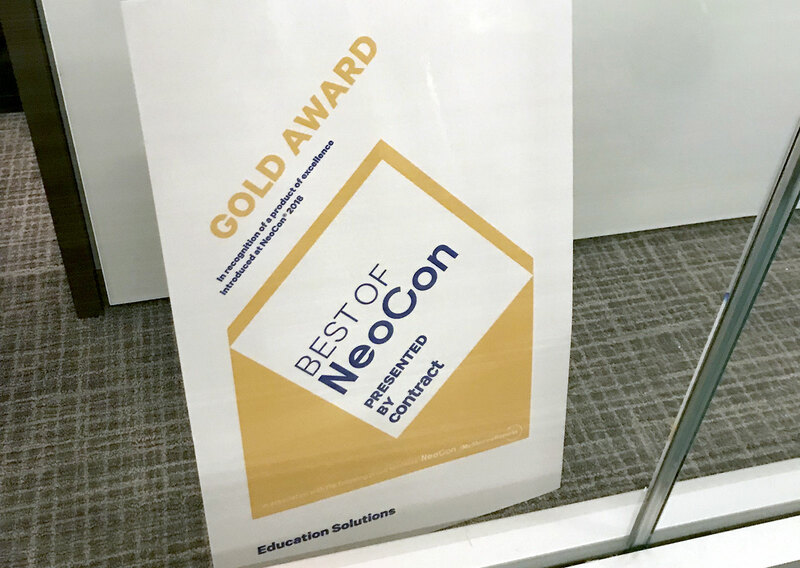 Congratulation to HON on their Gold Award for Best of NEOCON - Education Solutions! One other notable addition to the show were a number of booths using unfinished, sanded and/or routed plywood. This is just a great example of using a lower cost material to complement other materials and textures. We just thought these were really cool. It was great to see so many familiar faces and also meet a few new ones. For those that did spend time talking to us we appreciate you taking a few minutes out of your day. We’re excited about the new products we saw and hope to add a few new capabilities to our offering to respond to them where it makes sense for our customers.